New public kerbside charging and connectivity technology has been demonstrated in London today to show how the Government’s electric vehicle ambitions could be turned into reality. 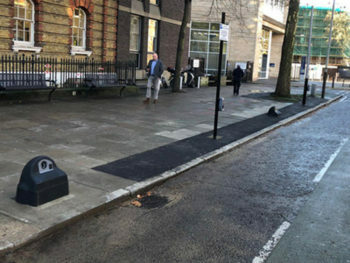 Working with Southwark Council, and supported by Virgin Media and National Grid, Connected Kerb has installed the EV charging bays in Borough Road, SE1, ahead of a planned roll-out within the capital and elsewhere in the UK. The technology uses “discrete and sympathetically designed” kerbside units made from recycled materials to offer simple, efficient and cost-effective ‘drive-up’ roadside charging and internet connectivity points for EV motorists. Backed up by fibre broadband powered by Virgin Media, the technology turns the charging points into connected chargers that support multiple charge point solutions as well as connected car applications. The units are said to have been future-proofed to enable new charging technologies as they come online and also provide data such as environmental, weather and traffic monitoring data for public authorities. Paul Ayres, COO, Connected Kerb, commented: “As electric vehicle ownership increases at pace, the need for a nationwide infrastructure has become critical, and we are delighted that London electric vehicle motorists will be among the first to benefit.